Female eggs lays 300-500 fertilized eggs in cluster on the upper surface of mulberry leaves. The egg hatch into the larva after ten days. Newly hatched larva is 4-5 mm in length. It feeds on mulberry leaves for 10 days. The larva undergoes 4 to 5 moultings. After each moulting, the larva increases in size. After the last moult, the larva is known as caterpillar. Well grown caterpillar is forms after 25- 30 days. It is about 7.5 cm in length and 4.5 gm in weight. It is voracious feeder. It feeds continuously till six days. After six days, it stops feeding and becomes inactive. The inactive caterpillar starts secreting a silk fibre through the mouth. Silk fibre is secreted by two pairs of silk glands. Proteinous material is secreted by one pair of gland called fibroin and gummy substance is secreted by other pair of gland is called sericine. The silk fibre becomes hard on contact with air. A single caterpillar secretes 1000 to 1500 meter long continuous silk fibre. The fibre is wound around itself by rotating the head. Complete cocoon is formed around the caterpillar within 2-3 days. Cocoon is oval in shape, white in colour and measures 2.5 to 3.0 cm in length. The caterpillar inside the cocoon is converted into pupa. Pupa remains dormant for few days and then it develops into imago. 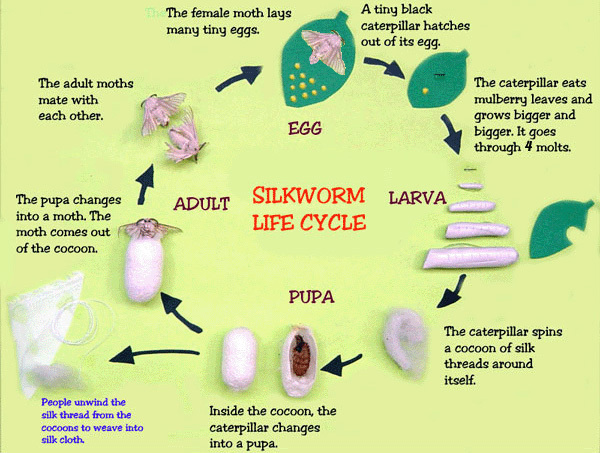 Imago is developed from pupa within 10-12 days. Imago is an immature moth. It ruptures the cocoon by secreting alkaline substance and comes out. It attains maturity and lays eggs. Thus, life cycle is repeated. Explain life cycle of bacteriophages?